The book (magazine) cashier-teller - a mandatory attribute of cash documents of firms that have a cash register. 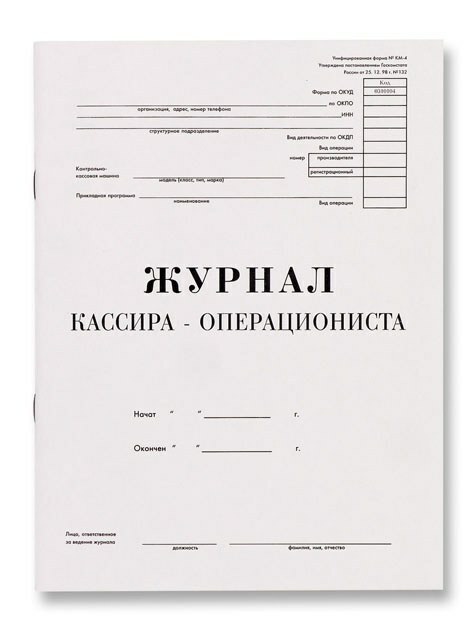 This document along with the RKO and PKO refers to forms of the strict reporting. Date is taken from the shot at the end of day Z report. If during the day on one cash register there were a number of Z-reports, then they should be in separate rows, but the date to specify the same. The word "change" in this column means that the same cash register worked two different cashier. For example: 01.08.2014 (1) and 01.08.2014 (2). This symbol can be used in the organization as desired. If the Z report is provided for the penetration of goods/services by departments, to fill in this section should be on the Z-report. If the organization gets sales in the same Department, for example, Department 1, filling the box is not required. In the box is entered the name of workers per shift cashier-operator. Column is designed for entering the sequence number of Z-report, which is usually printed in the upper part of the captured Z-report. Numbers must be in chronological order, if a number is skipped, it means that a Z-report was filmed, but in the magazine of the cashier-operator for some reason were not included. This graph is usually not filled, or filled with indices of "0" because the magazine assumes that the counter Z-reports should be zeroed out. In modern machines, this feature is removed. Count mandatory. It is to be paid cumulative at the beginning of the day, the figure which is taken from the Z-report. This is the sum of all punched at the cash register of the money for the entire period of its existence. Every shot Z-report, this amount increases. If things run smoothly, it should equal the cumulative total for the evening of the previous day (column 9). When buying a new unit, the first accumulation will be 1 rubles 11 kopecks (satisfies the requirement that tax inspections tax inspector when registering a cash register. In these graphs sign cashier and administrator. In some organizations this position is one and the same person, in this case, the signatures will match. In the box are made of accumulation (a non-nullable result) at the end of the work shift. Logically, this amounts from the column 6 to which added revenue for the past day. Readings are taken from Z reports, taken at the end of the working day (shift). In the box paid the amount of revenues per working day (shift), which is taken from the Z-report. It includes both the amounts punched in cash and non-cash sales and returns during the day. In the box paid the amount of the proceeds from the Z-report minus noncash sales. Typically, this data cell is the data of the previous one. If the Z-report provided by the division of the proceeds in cash and non-cash money, in column 12 is the number corresponding to the number of purchases via Bank transfer day, and the graph 13 – total amount of such purchases. If the Z report there is no separation, the column is not populated. In the graph cumulative cash and non-cash amounts (graphs 12 and 13), from which we subtract the sum of the refunds (if any). If the day Z-report has been broken returns, the sum specified in this column. If there were no returns, line is blank or put "0". The cashier puts his signature in this column and before you hand over the cash administrator, fills the reference-report of the cashier-operator according to the form KM-6, which requires information from the Z report. The administrator receives cash from the cashier, verifies the correctness of the calculations and signs in this column. The graph is intended for the signature of the head, which puts it at the end of the shift and putting the cash administrator.